PAXCON® is able to improve the blast resistance of lightweight modular structures. For the blast test below, PAXCON® PX-3350 polymer was applied to both the outside and inside of a 10-foot by 20-foot construction trailer. 500 pounds of ammonium nitrate-fuel oil (ANFO) explosive was used to generate 12 psi pressures on the trailer. 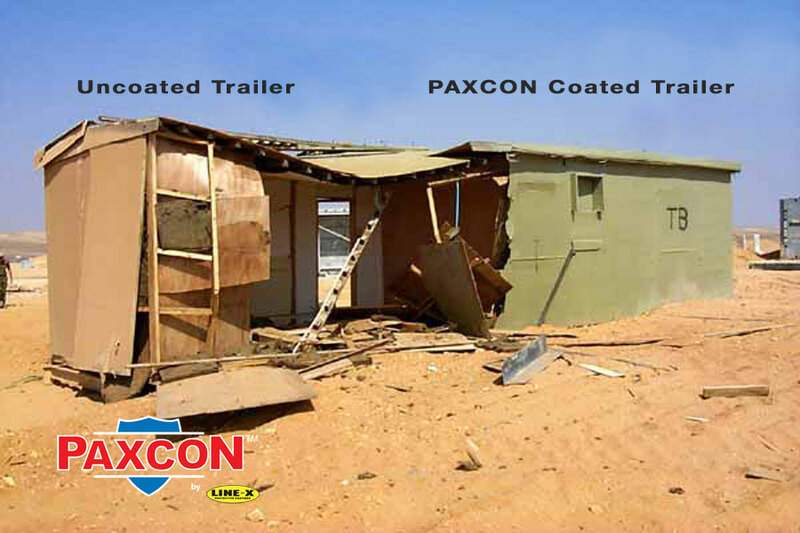 As can be seen below, the trailer walls underwent large deflections and the PAXCON® polymer protective coating had some tears in the membrane, but virtually no wall fragments entered the occupied space. These types of structures, characterized by timber stud walls, exterior aluminium siding and interior veneer-plywood panelling, are widely used during extended deployments, such as our forward installations in Southwest Asia.